In the 1980's I bought a book by Fred Hoyle and Chandra Wickramasinghe called 'The Intelligent Universe' which made the case for 'panspermia' - the idea that life on earth is seeded by bacteria, viruses and other proto-biotic material from outer space. It cited evidence of clouds of proto-organic material in interstellar space, and a great deal of other evidence, in support of its claims. I don't think panspermia is taken very seriously by the scientific establishment, but it appeals to my imagination - earth-like planets as ova, and comets as sperm - hence, 'panspermia' - which epitomise, on a planetary level, the process of sexual reproduction. It appeals to both the scientific and religious imagination; life as a cosmic process is surely a satisfying, modern 'creation myth', or so it seems to me. I have stumbled on a website by a researcher, Bryce Krig, who has apparently made research and advocacy of this theory his life's work. The site goes back quite a few years and still seems to be regularly updated. It has a ton of material on it, including a lot of outlinks to papers on evolutionary biology and current science. I reserve judgement about the veracity of the basic idea - it seems credible to me, but Chandra Wickramasinghe, who now carries the torch for the scientific theory of panspermia, has been accused of tendentiousness and sloppy scientific practice by the media. Nevertheless, an interesting idea and site to investigate. This is the intro page. From the webpage, it seems like they are saying single cell organisms from other planets are brought to earth, where they seed life here. Is that your understanding? I thought it might also mean that the constituents of life were brought here. If single celled organisms came here from space, that doesn't really answer any questions. It just pushes the origin question to another planet. I remember maybe 10 years ago, a meteorite was found that had organic material encased in it. It was speculated at that time that this might be evidence of life and might be how life began on earth. I find the idea of pan-spermia quite fascinating, and I don't see any reason why it would not be plausible. If abiogenesis is as rare an event as they come (the formation of that first replicating cell), then we can perhaps use pan-spermia to explain our apparently lucky existence. Until we actually discover some life elsewhere or crack abiogenesis though, we have no way to determine how likely or unlikely the formation of life actually is. But if we can show that it's possible for single cells to survive the long cold trip between solar systems, then it becomes at the very least, plausible. I reckon the only meteorites striking the earth that contain organic matter are the packages of poop jettisoned from the ISS :D . If you can find the original source, it might be interesting though! It is my understanding that the findings are still controversial. More than just single-celled organisms - also viruses and other bits of genetic material. Actually they make the case that some epidemics originate from extra-terrestrial material. But there's a ton of detail in the original book, The Intelligent Universe, which is now out of print (although a lot of the gist is on that site I provided). The link I provided is to a critical review of a claim by Wickramasinghe to have found fossilised diatoms in a meteorite. 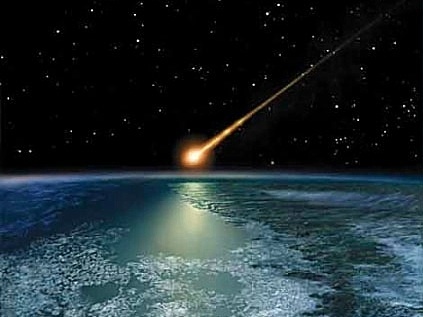 The doubt arises because the analysed fragment may not have been a meteorite, but simply dislodged by a meteor strike; the article basically accuses Wickramasinghe of failing to exercise due diligence around this point. Wickramasinghe comes across as a serious scientist, but his whole latter career has centred around this idea. So again, it might be regarded as fringe science, but I find it interesting nonetheless. I think it is really interesting also. It would be neat if it were true. It is my understanding that it is also possible. But, if the question is how life began, it doesn't answer any important question. Right! That is one of its most attractive features, in my view. ;-) But then, I'm one of the kinds of people that secretly hopes there are yetis and other unexplained mysteries. I find the idea more plausible than not. If Earth now gets clobbered by a big asteroid, it will eject tons of life into space, plenty to drops some seeds on some fertile planet somewhere. The hardest part is getting the shrapnel up to escape velocity in order to make the trip to other star systems before those stars die out. A few billion years is hardly enough to make the trip. Indeed, it does not answer the origin question, but it opens up possibilities to the origin being in some environment that would never plausibly be found here. This one seems pretty unlikely. Earth has made life its own, evolving well beyond whatever may have dropped from space. Any virus from space would not have evolved to infect terrestrial life. Epidemics are home grown I would think. If you actually dig into that site, they have epidemiological evidence to support the argument. The suddenness of outbreaks, and the patterns of occurrence - that kind of data. There is a lot of "organic" chemistry going on out there. In 2014 Iso-propyl cyanide was detected in a star-forming cloud 27,000 light-years from Earth. Iso-propyl cyanide is "organic" but it has a long way to go before it's like the stuff inside your shirt. Amino acids have been found in dust clouds, too. If you mix up a batch of basic chemicals you will get amino acids. They are "organic" but not "life". Still, when the earth was forming from the Great Dust Ball which became our solar system, there were, like as not, a lot of these chemicals included. Most of them would never have been available to be life because most of the our share of the GDB ended up as the solid earth, and the surface was VERY hot, and the chemicals would have been morphed and remorphed zillions of times over. Even so, as the earth cooled for the last time (around 4 - 3.x billion years ago) some of the organic chemicals were on the surface, and likely more was falling. The organic chemistry, including the amino acids, might have become life because of a photo-life form falling to earth and getting the ball rolling. As noted, panspermia doesn't solve the origin of life problem. It's as improbable as life starting here on its own (which, however, it seems to have done -- else we really are a simulation running on a computer in another star system). Is Your Interest in Philosophy Having an Effect on How you Live Your LIfe?